The Most Offensive Verse in the Bible – Love this. C.S. Lewis: A Life – Another one for the TBR pile. Reaching Catholics in Your Community – “It is not enough to understand Catholic doctrine; we must also pause to consider assumptions, priorities, attitudes, fears, and common commitments.” Some interesting distinctions here. Anathem – $1.99 is a pretty awesome deal for a book this massive. I haven’t read it yet, but it comes highly recommended. This is good stuff, folks. I recommend you take time to watch the videos, but MP3s are available as well. The first lecture is featured above – you can find the rest here. Also, a warning to my fellow bibliophiles: you’re reading list may explode when Myers starts dispensing book recommendations. Arm yourself with a notepad. For Christ the conqueror of my soul. My head with joy is humbly bowed. Keeps, and shall keep me, unafraid. Meet Ignatius J. Reilly, a 30-year-old savant who lives at home with his mother and fills his writing tablets with sophisticated musings on history and modern culture (he intends to publish them someday, of course). Reilly’s quiet existence descends into chaos when he is nearly arrested by an overeager policeman – who mistakes him for a “prevert” – and then involved in a car accident with his inebriated mother at the wheel. One thing leads to another (and another and another), and in the end, our hero finds himself doing the unthinkable: hunting for a job. All this happens in the first fifty odd pages of John Kennedy Toole’s A Confederacy of Dunces. The remaining three hundred fifty are dedicated to showing us that finding a job and keeping a job are two different things – and Ignatius J. Reilly isn’t particularly good at either one. … [A Confederacy of Dunces] is comic genius. Toole is able to plumb the accents and mindsets of the different communities and neighborhood of New Orleans better than any author I’ve ever seen. He also examines what it means to be a sojourner in a strange land. The protagonist is a native New Orleanian who never got past Baton Rouge in his travels beyond the city. Even so, he’s a stranger as one who is trying to grasp medieval philosophy as an “anchor” in a changing and shifting world. For the record, I still respect and admire Mr. Moore – and I wouldn’t presume to set myself up as a better literary critic than he. I must, however, confess myself puzzled at his love for this book; puzzled at the accolades it has received; puzzled that it won any prize at all, let alone the Pulitzer. Maybe it’s just me. Maybe I’m missing something. 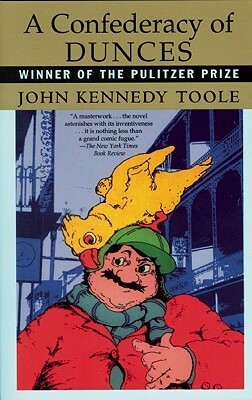 All I know is that A Confederacy of Dunces is the least hilarious “comic masterpiece” I have ever read. There’s no denying Toole’s talent as a wordsmith. He writes in a beautifully zany way, and the dialogue sizzles and snaps like bacon in a skillet. And though I’ve never been to New Orleans, I fully enjoyed his lively, color-saturated description of the place. What I missed was the humor: and that’s not something you want to miss in a book that’s purportedly a laugh-riot. And these reviews make me wonder… Did we read the same book? Is there a Special Edition I failed to get my hands on? Am I, perhaps, an idiot? My non-enjoyment of this book had much do with the fact that I detested the hero from start to finish. I say “hero” with my tongue in my cheek and a grimace on my face. Ignatius J. Reilly is loathsome, despicable, mean, uncouth, overeducated, arrogant, beastly, obnoxious, and downright gross. Enduring four hundred pages worth of this whiny, flatulent manchild didn’t simply push my buttons; it ruddy well smashed them. Following Reilly’s attempts at finding and maintaining a proper job did have its amusing moments, but no matter how much I wanted to be blown over by gales of laughter, I never was. I don’t recall laughing out loud even once during the entire book. What about those bellyaches, New Republic, those streaming tears of mirth? Pish. I’ve read toothpaste labels that were funnier.